Which animals might qualify as “Europe’s Big Five”? According to the Belgian TV-show “Dieren in nesten”, The European bison, the wolf, the brown bear, the wolverine, and the lynx are the “The Big 5 of Europe” – the continent’s five most impressive wild mammals. All these five are – and especially so the European bison which ranked as number 1 – among the symbolical species for Rewilding Europe and emblematic for the wildlife comeback in Europe. Chris Dusauchoit, a Flemish television presenter for the Belgian TV show “Dieren in nesten”, and the two young biologists Frederik Thoelen and Iwan Lewylle have travelled across Europe with the ambitious mission to try to define the five main wild icons of our continent. They visited interesting nature areas in Finland, Germany, Poland, Hungary, Switzerland, the Netherlands, Romania and Spain using four criteria: appearance, behavior, rarity and impressiveness. The highlight of their Big5 journey was to the 200 ha sand dune area Kraansvlak, a closed-off area in the Dutch National Park Zuid Kennemerland, The Netherlands. In 2007, European bison were brought back here where they since then live under completely natural conditions, together with a herd of wild Konik horses. The Kraansvlak bison pilot project is also one of the first members of the European Rewilding Network (ERN). The ”Big5” mission has had the support also from the President of the European Council, Herman Van Rompuy. 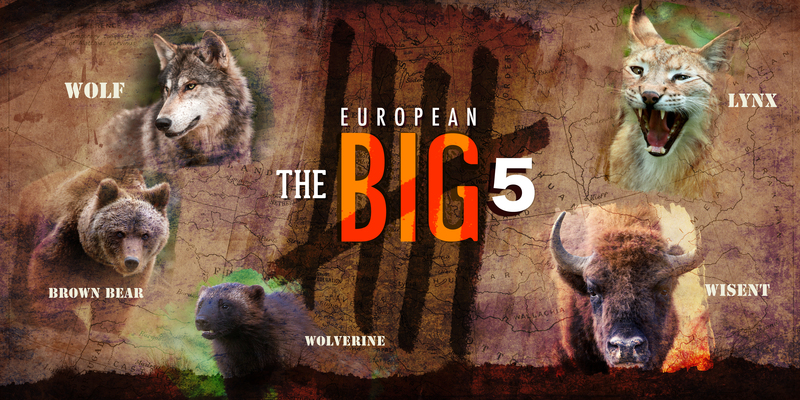 The search for ”The Big5 of Europe” was also assisted by a team of European wildlife experts: Staffan Widstrand, Communication and Marketing Director of Rewilding Europe, John Linnell, ecologist and senior researcher at the Norwegian Institute for Nature Research, and the Italian carnivore expert Luigi Boitani, Professor of Biology at the University of Rome. “The Big5 of Europe” was a programme by the public Belgian television channel Eén, and broadcast during five weeks from 11 January to 8 February 2014. You can still vote for your Big5 favourites on their website: http://www.een.be/programmas/the-big5-van-europa/welk-dier-is-jouw-kandidaat. After each vote for Big5 wildlife species you can see the results.